NOTICE: THE ACTION PISTOL MATCH PROGRAMS HAVE BEEN CANCELED EFFECTIVE 9/01/2017 FOR THE REMAINDER OF THE YEAR. The Amarillo Rifle & Pistol Club offers IDPA Action Pistol Matches in our two Pistol “Pits” located east of the Indoor Range and just west of the Benchrest Rifle Range. IDPA matches are held year ‘round. See the club calendar for exact dates and times. Matches are open to all responsible shooters. Membership in IDPA is not required. The entry fee for all competitors is $7.00 for each match. If you’ve never participated in IDPA we do recommend that you observe at least one match before actually competing. 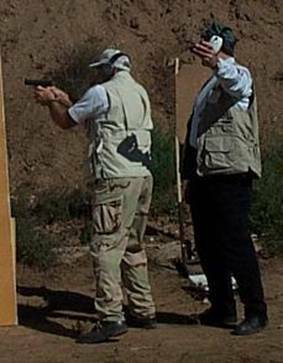 IDPA (International Defensive Pistol Association) competition is based around the requirements of concealed carry. The principles of the IDPA are to create a level playing field for all competitors, to promote safe and proficient use of self-defense equipment and abilities, to provide practical and realistic courses of fire simulating life-threatening encounters, to provide a stability of equipment rules, and to offer a forum for use of standard factory-produced handguns. IDPA seeks to develop the abilities and skills of the individual, not their equipment or gamesmanship. Matches require the use of practical equipment: handguns and holsters suitable for concealed carry using full-charge ammunition. There are four basic divisions of handguns in IDPA: Stock Service Pistol, Enhanced Service Pistol, Custom Defensive Pistol, and Stock Revolver. Each division competes only within that division. For more information about IDPA, including the complete rule book, please visit the IDPA website . For additional information concerning Amarillo Rifle and Pistol Club IDPA matches, contact the Action Pistol Director or any of the IDPA Match Directors listed on the Contact Information web page.